See that face? 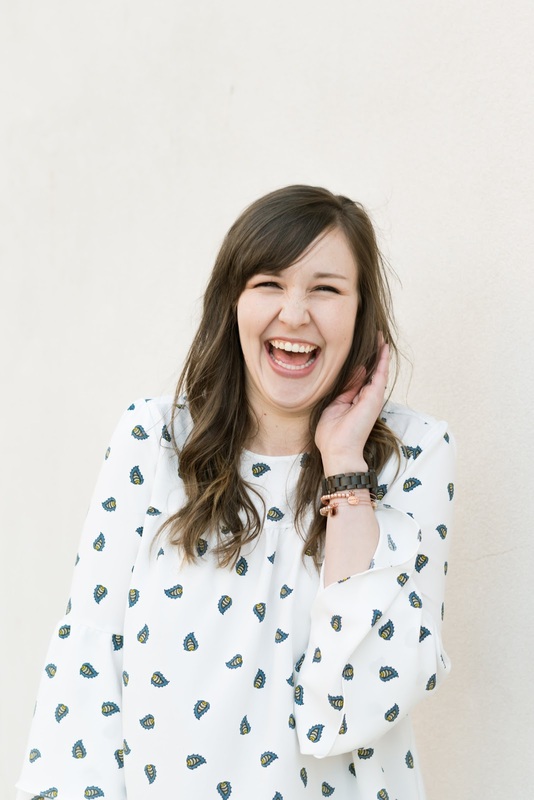 That's how excited I am to share my casual date night look and giveaway! Ya girl loves a good engraved accessory, so if you're on the search for a unique gift idea, I got you! With Valentine's Day on the horizon, I thought today would be a perfect time to share a casual date night look and a timeless (pun intended) gift idea! 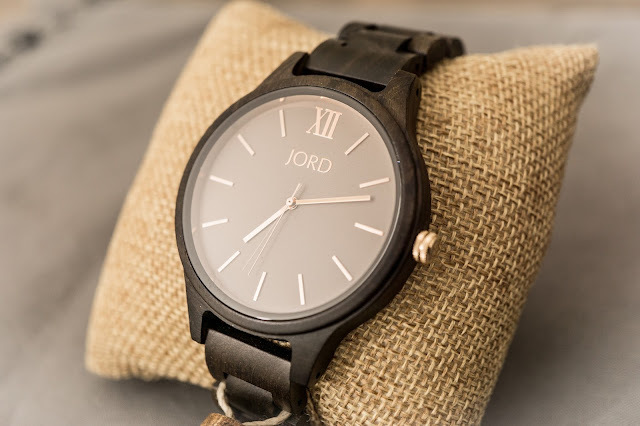 Whether you're buying for your man or you want to #treatyoself, an engraved wooden watch is the way to go. 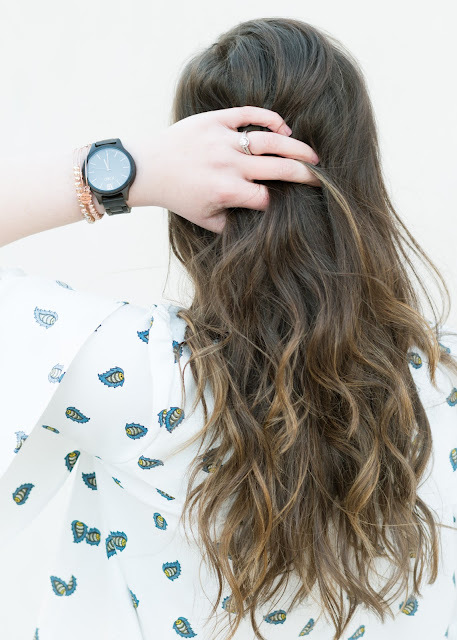 The lovelies over at JORD have partnered with me for this post and are giving away a $100 credit towards a watch on their site! Be sure to read to the end for details on how to enter. P.S. If you're not sure what to do for date night, I shared some unique and easy date night ideas in this post! Have you ever watched a chick flick where the romantic interests decide to go out for dinner and the guy says, "Great, I'll pick you up at 8?" Kyle and I always laugh when that line comes up, because let's be real... who wants to head to a restaurant at 8pm for dinner? I would be so hangry at that point that no one would want to be with me! 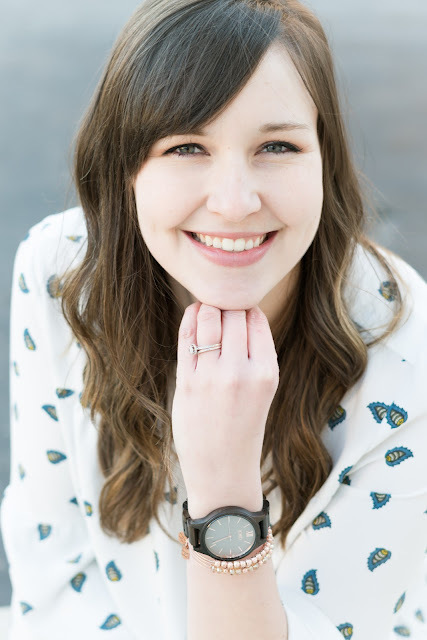 While fancy 8pm date nights might be nice, for our casual lifestyle, they are unrealistic, and frankly, we much prefer to go downtown for a burger and ice cream for date night than eat from a menu that I can't even read... anyone else with us? I'd say one of my favorite ways that Kyle shows me his love is through his gift giving. In the entire time that we've been together, he's only ever given me 2 roses. From the start of our relationship, he's invested in gifts that are so meaningful, and I love when he gifts me jewelry that I can wear every day. One of the very first holiday gifts he ever got for me was a beautiful timepiece for Christmas. I remember wearing that watch every day. Investing a bit more money in classic, statement pieces that you know you will wear frequently is something I'm passionate about. I've said it before, but I am always trying to narrow down my wardrobe to pieces I can get the most wear out of while maintaining my style, even if it costs a bit more upfront. 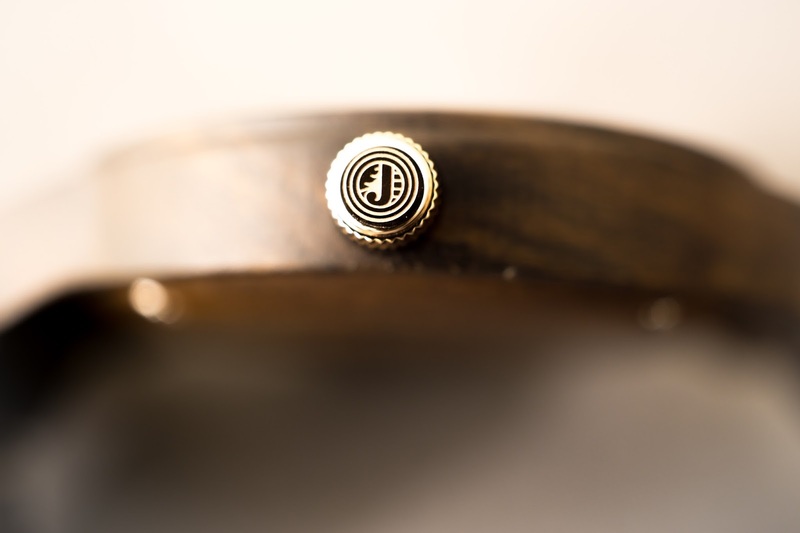 For my look, I selected the Frankie-Dark Sandalwood & Smoke wood watch. 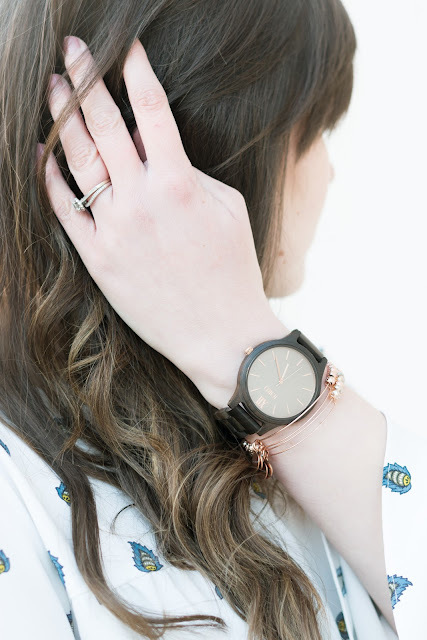 I love the dark wood in combination with the neutral and rose-gold face. 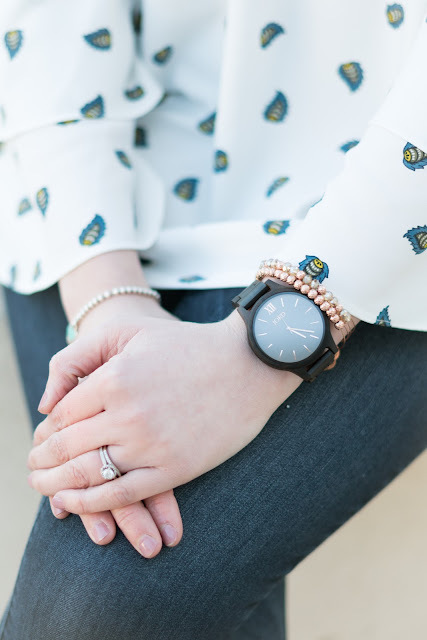 While it's definitely a casual watch, I love that I can either dress it up or down with my outfit and accessories. 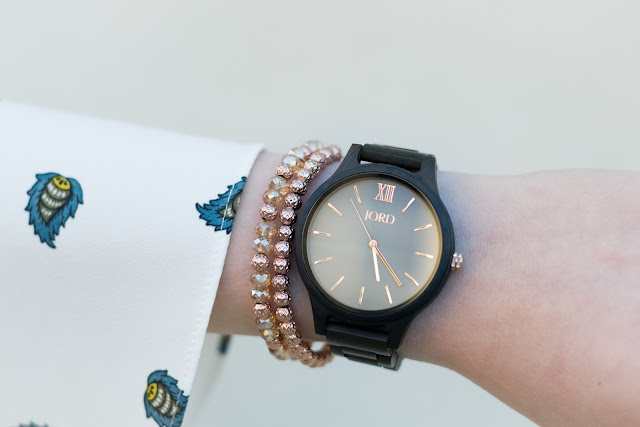 The rose gold details give it the perfect amount of feminine appeal as well. 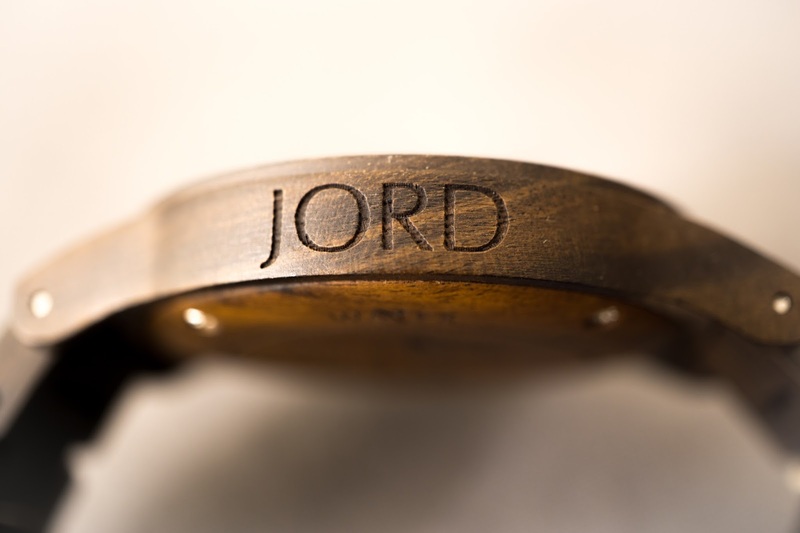 JORD also has an awesome selection of men's watches, and I love that you have the option of engraving them with something special for your love. Also, if you're a smartwatch fan, they even make wood bands compatible with the Apple watch! How cool is that? If you've got a special lady in your life, check out the selection of women's watches as well. Why wouldn't she want a timepiece with a love note permanently engraved to remind her of your love every time she puts it on? 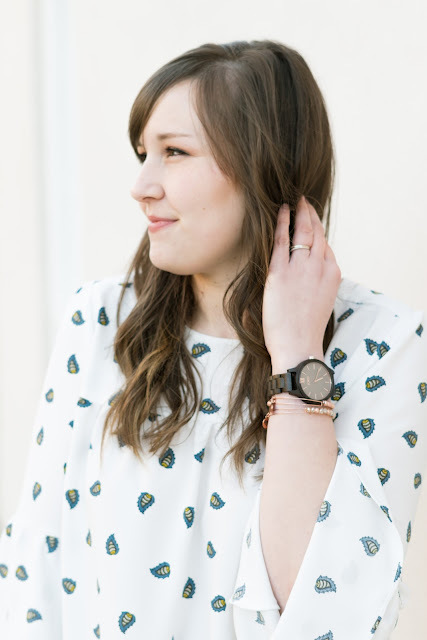 I paired my watch with a ruffle sleeve shirt from Loft, my favorite Wit and Wisdom jeans, my Alex and Ani bracelets that Kyle got me for Christmas, and I was good to go! 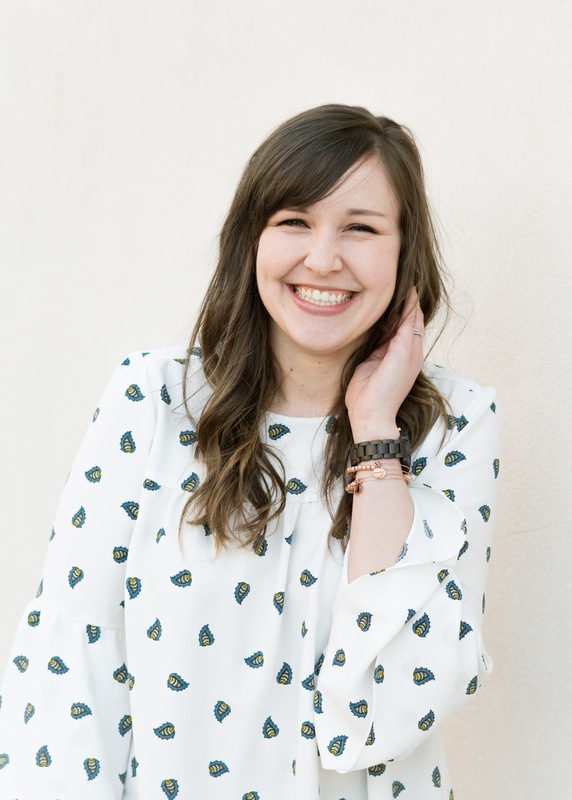 I really don't get too fussy over casual date nights, and I want to encourage you to find a Valentine's date night look straight from your very own closet. 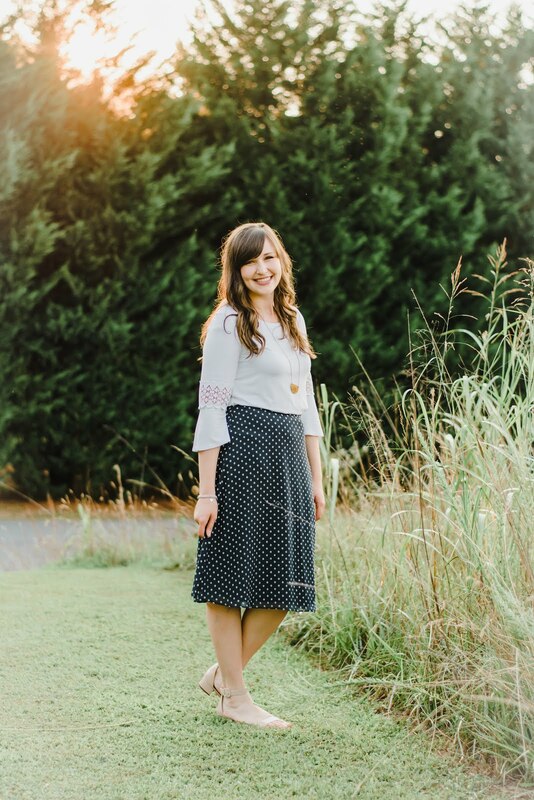 Try a combination of pants + and a top that you've never tried before! Be creative, and don't waste your money on a fancy dress you'll never wear again! 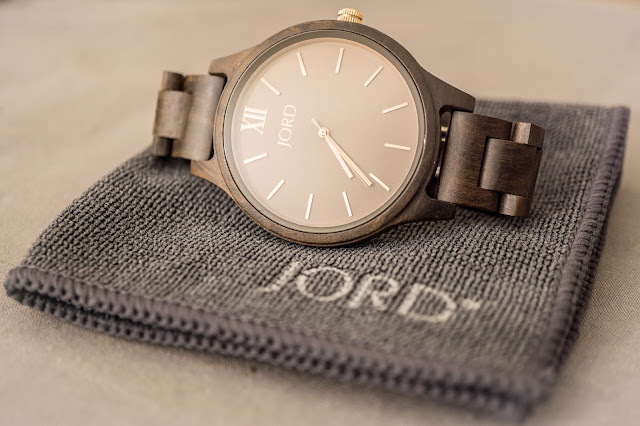 JORD is giving away $100 to one of my readers towards any watch on their website! Click here to enter the giveaway! The contest ends on February 25, 2018. Be sure to let me know in the comments what you plan to do for your Valentine's Day date night, and I hope this outfit and gift inspo help! I love JORD watches, they're so unique but not outlandishly so. Thanks for sharing your tips! Totally agree! They are very classic. Thanks for reading!